patches paper boat on lightblue, iron-on patches, Flickli - solid jeans patches perfect suitable as knee patches! Ship accessories as paper boat applique for children and adults. 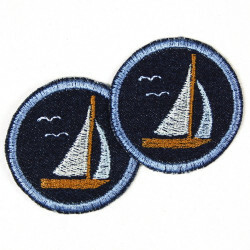 These cool paper ship patches around in light blue colors is deposited with a high quality ironing film. So, mounting this ship iron-on patches is not a problem! The pants patch with boat is made of solid denim and also perfect as a knee patches. 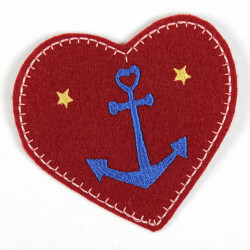 The ship patches is supplied in a package with a detailed ironing instructions. This iron-on patches are really a must have for a sealife fan! 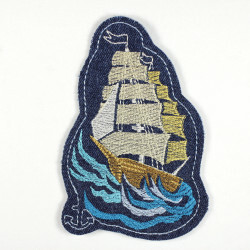 The ship is also as a nice iron-on applique for adults jeans jacket usable. 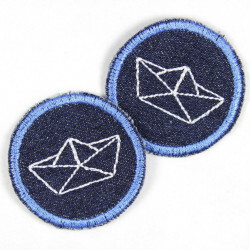 There are more cool iron-on patches ships available! Size: 5,5 x 11,5 cm. The offer is for a knee patches paper boat light blue (Fig. 1). The 2. figure show a further view of these iron-on patches in the ship design.